Are you facing your Jabberwocky? Have you watched Alice in Wonderland movie based upon the classic novel by Lewis Carroll? 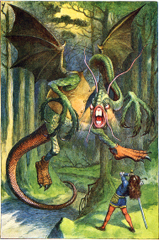 Although the movie takes some very creative liberties with Carroll’s poetic portrayal of the Jabberwocky, there is a point where Alice confronts the Jabberwocky. Drawing upon her past and encouraged by the words of her father, Alice confronts and slays the beast. It’s a moment we can all resonate with, a point in time where we look bravely at what we fear and step forward into our power. This may show up as confronting an uncomfortable situation or person, taking responsibility, doing something outside of you comfort zone, or facing a fear. Here are some ways that the Jabberwocky may be showing up in your business. 1. You are given opportunities that you don’t follow-up on. This may happen when you are asked to do something outside of your comfort zone, such as collaborate on a project, speak at an event, or follow-up with a potential client after a meeting. There is tremendous power in reaching out and connecting, or doing something that’s uncomfortable so you can be of service to others. I had this happen the other day, where my massage therapist knew I was out of town, and I would be returning, and he called me when I was back to see when I wanted to schedule my next appointment. It was a simple caring act, and I appreciated his follow-up. So you may want to reflect on where are you missing the opportunity to follow-up in your business-and if there any fears, how can you release these so you may be of greater service to your clients? 2. You are uncomfortable by ________________ (fill in the blank), so you avoid doing it. I know this too well from my own personal experience with public speaking. I had such a tremendous fear of speaking in front of groups, the first time I had to do so I almost got sick in the middle of my talk. That could have been it for me, instead I kept saying ‘yes’ to speaking opportunities and each time I would find a way to ease my fears (like having a powerpoint show with the lights off). Each step forward helped me to let go of my fears and truly was a powerful example of exposure theory. Now, I joyfully (and still nervously) accept new opportunities to share and present information, which has given me the opportunity to face my speaking Jabberwocky as presenter at a national conferences, as well as a keynote speaker. 3. You don’t know how to do something, so you do nothing at all. Technology has been moving so rapidly, it often feels overwhelming at times to keep up with everything out there. I know I gotten “technology paralysis” and I’ve become totally stuck because of information overwhelm. Here’s a way I face my technology Jabberwocky, or any other Jabberwocky that involved things I didn’t know… I continually let go of the belief that I am supposed to learn and know it all (what a relief) and I reach out (again and again) and get help. It frees up so much more energy and space, knowing that I don’t need to have the answers (thank goodness), and instead can ask for assistance. As therapists owning a therapy business we are given opportunities again and again to confront our Jabberwocky’s. This may happen when you are asked to do something outside of your comfort zone, such as collaborate on a project, speak at an event, or follow-up with a potential client after a meeting. There is tremendous power in reaching out and connecting, or doing something that’s uncomfortable so you can be of service to others. I had this happen the other day, where my massage therapist knew I was out of town, and I would be returning, and he called me when I was back to see when I wanted to schedule my next appointment. It was a simple caring act, and I appreciated his follow-up. So you may want to reflect on where are you missing the opportunity to follow-up in your business-and if there are any fears, how can you release these so you may be of greater service to your clients? I know this too well from my own personal experience with public speaking. I had such a tremendous fear of speaking in front of groups, the first time I had to do so I almost got sick in the middle of my talk. That could have been it for me but instead I kept saying ‘yes’ to speaking opportunities and each time I would find a way to ease my fears (like having a powerpoint show with the lights off). Each step forward helped me to let go of my fears and truly was a powerful example of exposure theory. Now, I joyfully (and still nervously) accept new opportunities to share and present information, which has given me the opportunity to face my speaking Jabberwocky as presenter at a national conferences, as well as a keynote speaker. Technology has been moving so rapidly, it often feels overwhelming at times to keep up with everything out there. I know I have gotten “technology paralysis” and I’ve become totally stuck because of information overwhelm. Here’s a way I face my technology Jabberwocky, or any other Jabberwocky that involves things I didn’t know… I continually let go of the belief that I am supposed to learn and know it all (what a relief) and I reach out (again and again) and get help. It frees up so much more energy and space, knowing that I don’t need to have the answers (thank goodness), and instead can ask for assistance.